Meet Chris Sears, Director of Sales Development and Lead Generation at hc1, a healthcare software product that provides marketing intelligence, live analytics and a CRM to their customers. Chris was looking for new growth channels to ramp up leads for hc1 and came upon the idea of using Linkedin outreach as a solution. Lead Cookie looked like the perfect fit and so hc1 engaged Lead Cookie’s done-for-you Linkedin outreach service. First, we took Chris through onboarding where we deeply understood hc1, their value proposition and who they were targeting. We did this over the course of a 90 minute onboarding call. Second, we built a series of targeting queues and outreach messages for their campaign. We collaborated with hc1’s internal team to refine the messaging and targeting for their outreach. Third, we then launched a series of niche campaigns targeted at small pockets of their ideal customers. Examples of some of these niches included blood banks, skilled nursing facilities, Senior communities, rehab centers, etc. Fourth, Chris sourced a list of prospects from a data provider and gave that list to us at Lead Cookie. We then ran a targeted campaign focused on reaching out to that exact list of target prospects. Our outreach included a 4 step drip sequence that was customized for each micro-niche and focused on starting a conversation on Linkedin. 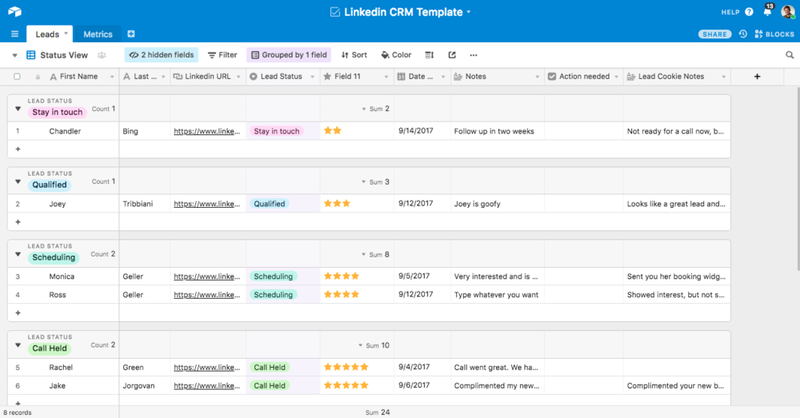 To keep things organized, we placed all of hc1’s leads into a tool called Airtable which made it easy for them to keep their Linkedin conversations organized. hc1’s team ended up customizing the various stages of this CRM and setting up an integration between Airtable and their own internal CRM, Hubspot. To help manage the large volume of leads and responses, Chris pulled in support from other sales team members to help nurture and handle the large volume of conversations. Lead Cookie has become the most consistent and significant source of marketing qualified leads that we have. Chris has been ecstatic about Lead Cookie and we still continue to create new campaigns and improve their results. Interested in getting started with Lead Cookie?